Our professionals provide patients with solutions that are not only functional and appropriate for the smile, but are also natural looking. Many patients are concerned that if they move forward with dentures, they may not look like their real teeth. Thanks to continued advances in restorative and cosmetic dentistry, our team can provide restorations that blend in with the smile and look natural. Dentures are an alternative to dental bridges and dental implants, which are also available at Calgary Dental Centers. Dr. Hanif Asaria encourages patients to speak to the team and undergo an initial evaluation to determine if they are candidates for dentures. Additionally, patients can ask about alternatives to see which option is the best fit for their specific needs and desires. Partial dentures. When one or more teeth within the dental arch are missing, patients can choose partial dentures. They are made with a metal and acrylic framework. They snap into place within the dental arch, using the existing teeth as support. The false teeth slide into place where needed and provide better functionality. Partial dentures are easy to remove for cleaning and care of the existing teeth. Full dentures. Full dentures are used for replacing an entire arch of teeth. They are fabricated with acrylic and include false teeth and gum tissue. They are custom-made for each patient and are held in place with natural suction or dental adhesives. Implant-supported dentures. 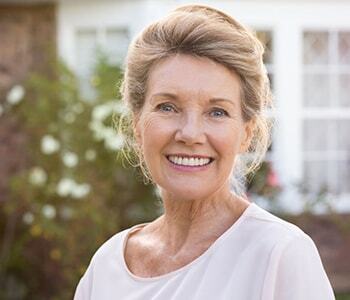 For patients seeking the ultimate denture experience, we provide implant-supported dentures. Implant-supported dentures use several dental implants along the dental arch to anchor a full denture in place. This ensures the smile is not only properly restored when all the teeth are missing, but gives patients the confidence they need to smile, laugh, and eat their favorite foods without worry! Dentures are typically easy to remove, which allows patients to clean them. Cleaning may require traditional brushing or soaking them in denture cleaner overnight. When patients receive their dentures, they are educated by their dentist on how they can extend their longevity. There are certain things patients can do to ensure their dentures last as long as possible before needing to be replaced or repaired. There may arise a situation in which a denture becomes broken. In most cases, dentures can be easily repaired with a visit to the dental office. However, if the breakage is more severe, patients may need to have their dentures replaced. Patients who have dental insurance may want to ask about coverage that can make these repairs or replacements. 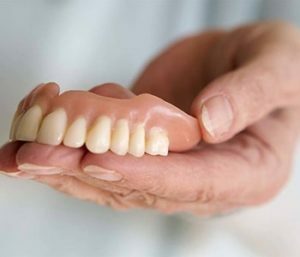 Do dentures look like real teeth? Yes! The team at Calgary Dental Centers ensures they use quality materials to create a realistic restoration. We evaluate the patient’s natural smile before we create the dentures to make sure the new dentures match in tooth size, shape, and color. This is incredibly important is matching the new restoration to the existing teeth in the smile. We strive to provide natural-looking tooth replacement options in our practice. Dr. Hanif Asaria and his team at Calgary Dental Centers provide this and many other options for patients who have lost natural teeth. If you are ready to restore your smile’s function and beauty, call one of our conveniently located practices in Calgary. Our practice at 127-12100 Macleod Trail SE can be reached at (403) 768-1339, and our practice at 10-5315 17th Avenue SE can be reached at (403) 768-1343. Call either one of our locations to book an appointment and get started learning about restorative dentistry solutions for your specific needs.